Leading Brexiteer Nigel Farage has said he doesn't think Ireland is pro-EU, claiming that the country has been "humiliated" by Europe. 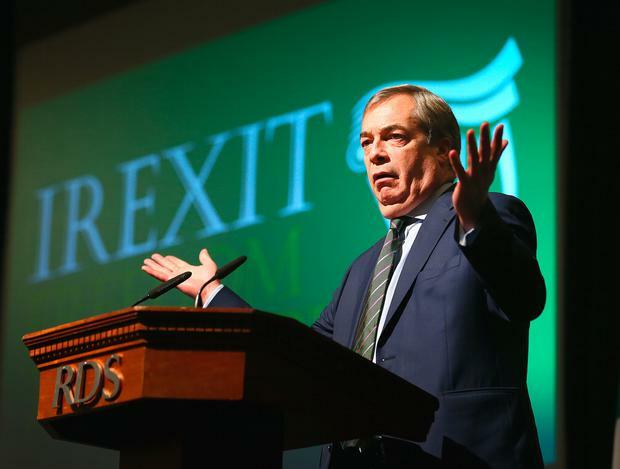 He made the remarks at the Irexit, Free to Prosper conference in Dublin where the controversial former UKIP leader sought to encourage debate on Ireland following the UK in leaving the European Union. Fianna Fail's Brexit spokesman Stephen Donnelly last night criticised the conference, saying: "The empty rhetoric on Irexit is similar to the nonsense sold to the British people in 2016." And Junior Finance Minister Michael D'Arcy dismissed Mr Farage's questioning of the benefits of EU membership to Ireland, arguing that many of the British politician's opinions are from a "very one-sided, biased, non-objective view about the European Union". The event in Dublin's RDS was organised by Mr Farage's Europe of Freedom and Direct Democracy Group and saw hundreds of people attend to hear speakers such as journalist John Waters and columnist Cormac Lucey. During his keynote address, Mr Farage brought up austerity after the economic crash and the financial bailout by the European Commission, European Central Bank and IMF, known as the Troika. "What on earth is going on in the politics of this country? "How much more humiliated can the Irish nation be than for years being run by the Troika?" the MEP asked. He also raised how Ireland has now become a net contributor to the EU Budget. He told the audience: "You are paying into the European budget and your Taoiseach said in Strasbourg the other week he is happy for Ireland to pay even more into the European budget. "Are you pleased about that?" Mr Varadkar said he was "open" to contributing more for things which advance the "European ideal" such as structural funds for Central and Eastern Europe. He has also spoken of how he believes the EU Budget needs to be well-funded, in part to protect the Common Agricultural Policy (CAP). Mr Farage addressed what he views as the perception in European media that Ireland is very pro-European. He said: "I don't think Ireland is a pro-EU country, I think the political, media and big businesses in Dublin, they are the ones." He also argued that the euro currency has been "bad for Ireland but a total catastrophe for countries like Greece". Mr Farage railed against the depiction of Brexiteers as xenophobes and bigots. He said: "They go for the man and not for the ball." Mr Farage got a standing ovation for his speech. People seeking tickets for the event online were required to confirm they agreed to terms and conditions that stated that the conference was "only open to supporters of an Irish Exit from the European Union". The terms also said: "Unwelcome interjections from the audience may result in removal from the event." Mr Farage was challenged on this by RTE Radio's Marian Finucane. He denied that people who disagreed with him weren't welcome at the event and added: "People who disagree but are coming along peaceably to listen to what's got to be said, of course that's fine."